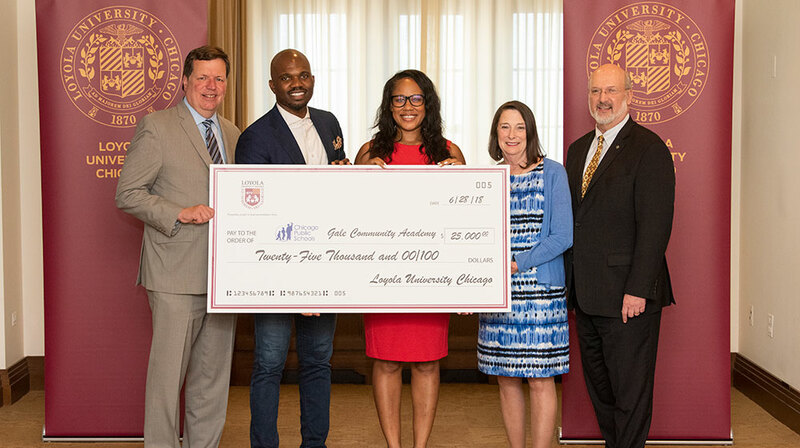 CHICAGO, June 28, 2018—Loyola University Chicago has committed a $25,000 donation toward the construction of a SMART Student Health and Wellness Center at Chicago Public Schools’ (CPS) Gale Community Academy in Rogers Park. This significant one-time grant means that the school can commence construction of the new clinic and represents a key turning point in the relationship between the two schools. Offering targeted medical and social-emotional support, the clinic will focus on academic outcomes and is completely integrated into the educational environment. Clinic staff will work closely with school faculty, staff, and administration to ensure they support the goals and needs of the students, functioning as an integral part of the whole school community. At Sullivan High School, also in Rogers Park, a SMART clinic replaced its existing, failing school-based health clinic in 2013. Since then, the population of students who receive health care increased four-fold to 85-90 percent from the 15-20 percent usually seen by traditional models. Likewise, attendance increased remarkably: more than 90 percent of students attend school regularly, with average absenteeism dropping from 36 days per year to 18 days per year, and disciplinary referrals also plummeted. Gale Community Academy Principal Augustine Emuwa encountered these considerable benefits first-hand during his time as an assistant principal at Sullivan and engaged the Ginn Group Consulting CEO Melanie Ginn, who developed the SMART model in collaboration with CVS Health, to launch another program at the academy. Since then, he has led the fundraising efforts in the community to match CVS’s grant. Forty-ninth Ward Alderman Joe Moore has been an important advocate for CPS, forming the Committee on Rogers Park Schools in 2017, and he has put his full support behind this new effort. Moore brought the initiative to the attention of Loyola administrators and requested the unprecedented cash donation. The University’s grant will enable clinic construction to launch this summer. Loyola has long enjoyed successful partnerships with CPS throughout the Edgewater and Rogers Park neighborhoods. In 2012, Loyola established a partnership with Nicholas Senn High School and helped launch its wall-to-wall International Baccalaureate programme. Since that time, the graduation rate has catapulted from 61 percent in 2013 to 90 percent in 2017 and its post-secondary enrollment has increased from 57 percent to 62 percent. As the relationship with Gale Community Academy strengthens, it will also allow for expanded opportunities for Loyola’s students, including teacher preparation and nursing clinical experiences as well as other forms of engaged teaching and learning. Through Schools 2020, Loyola already supports several collaborative projects with Gale. One such project is in Loyola’s Center for Science and Math Education. With generous funding from the Polk Bros. Foundation, the center ensures teachers at Gale and other neighborhood schools are professionally trained to implement high-quality science instruction that is aligned with Illinois’ Next Generation Science Standards.